Residents of southern kibbutz awaken to find blaze destroying massive amounts of animal feed; arsonist may be from nearby Bedouin town. 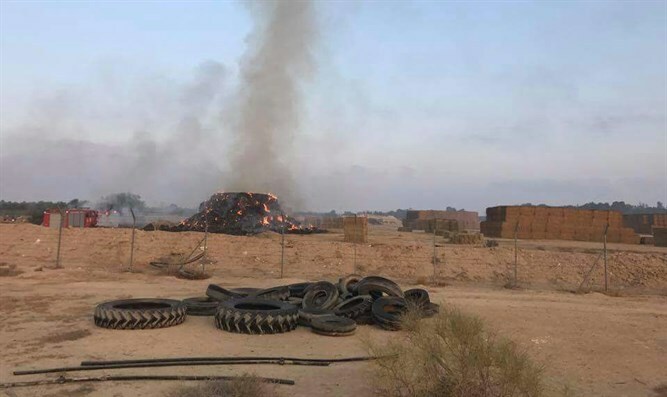 Residents of the Negev's Kibbutz Revivim (south of Be'er Sheva) awoke on Wednesday night to an enormous fire, which destroyed massive amounts of hay and animal feed. Initial investigations found the fire to be arson. This is the not the first arson incident Revivim, and in previous cases of arson targeting kibbutz property, evidence indicated that the culprits came from the nearly Bedouin village of Bir Hadaj. Last week, authorities arrived in Bir Hadaj to issue demolition orders against illegal structures there. Revivim residents believe Wednesday night's events are a "price tag" attack against the Jewish State. Regavim has stated time and time again that there is a lack of law enforcement in the Negev. "This must change starting with the police, and must include all relevant bodies. Israel can not back down in the face of threats like these and must act as the sovereign entity to restore law and order in the Negev for all of its residents," a Regavim spokesman said.